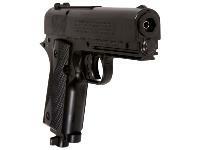 Daisy's Powerline 15XT CO2 BB pistol shoots 15 shots as fast as you can pull the trigger! 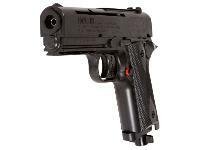 It makes a great pistol for firearms training, but you'll want to shoot it for fun, too. 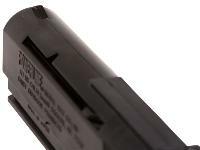 The built-in magazine is easy to load, so you spend more time shooting and less time fiddling with small clips. 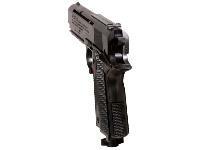 You can even mount a red dot sight on the 3/8" dovetail rail for greater precision. Add a laser to the accessory rail! 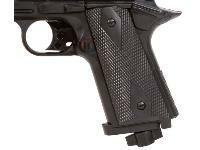 The synthetic frame has checkering on the pistol grips. Because the gun is ambidextrous, anyone can shoot it. Never shoot BBs at metal objects! Click the AMMO link to stock up on BBs. 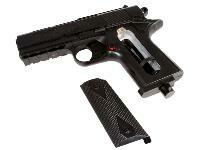 Check the ACCESSORIES link for CO2 cartridges, red dot sights, targets, maintenance items and safety gear. Things I liked: The exact size as a real 1911 handgun so it fits my holsters perfectly, making it great for draw practice. Gets about 50 shots per CO2 on a cold 30 degree day, with tin can penetrating power on all but the last few. Things I would have changed: The removable grip/CO2 cartridge cover seems a little flimsy, so you have to be careful not to break off the plastic tabs when using it. 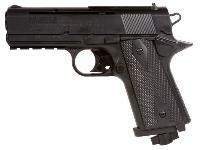 What others should know: A good value for $30, nicer than guns that cost more, made in Japan not China. Accuracy is actually pretty good for a short barrel BB pistol. 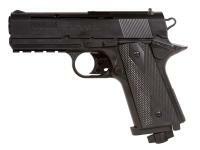 You definitely want a BB speedloader for this pistol. 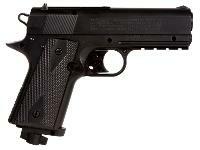 With one, reloading is faster than with any clip fed BB pistol. 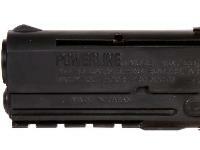 15-shot CO2 BB pistol, built-in magazine, truly ambidextrous.